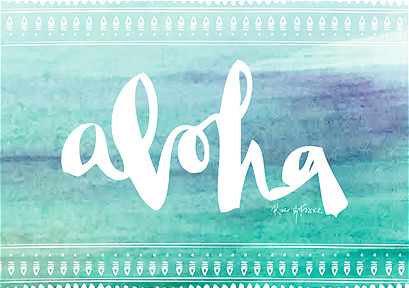 It’s official… Hawaii stole my heart. 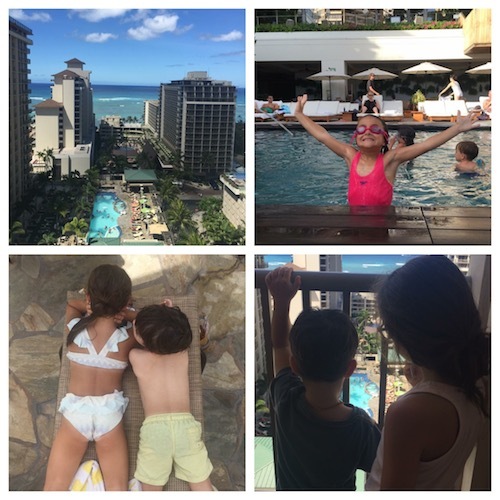 I’ve had so many emails and messages asking me about my time in Hawaii (Honolulu), where I ate, where I stayed, what I did and all that jazz, I’m here today to share of my sweet time away and my guide to Waikiki. Jetstar flies direct to Hawaii which is the solid reason we have flown with them the two times we’ve visited. Flying direct with two kids is important to me. The kids were champions. Only downside – somehow my booking for their entertainment didn’t work, so Daddy K was stuck listening to his music rather than watching the latest box office hit. At least for our return flight we were sorted. I can’t rate Jetstar international enough – really great. For me, a real holiday for me starts with a great place to stay. If I don’t feel as though I’m in my home away from home, it shows (just ask my husband). I get grumpy and I find it difficult to relax. But when I’m happy, I let it all go and this can also see me having that much needed time in the most heart centred space with my little family. 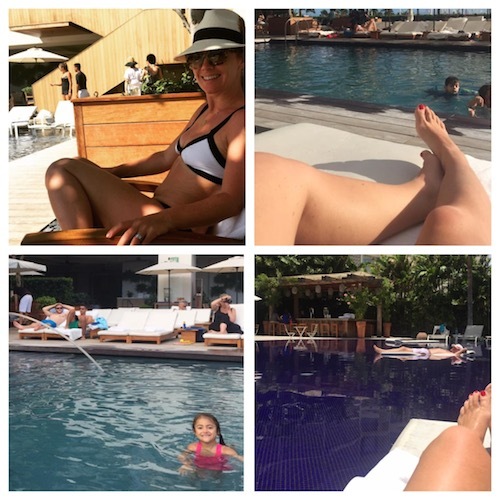 Whilst in Waikiki this time around, we stayed our majority of time at The Modern Honolulu. I can not tell you (and I’m not endorsed to say this), hands down one of the best places I’ve ever temporarily lived. I felt so very much at home. So much so, I hardly moved. I didn’t need to. Morning breakfasts on their “Passageway” overlooking the pool, set the tone and we pretty much spent the majority of our time at the pool because it was so darn gorgeous. The food at the Modern is excellent and of course the rooms are a delight. If you are considering staying there, check out their ‘friends with benefits’ program which sees you entitled to a host of goodies, including complimentary nights stay if your bookings meet the requirements. My idea of a holiday is one which involves poolside/beach side relaxation, good food and a little (or a lot of) shopping. I’m a terrible tourist, but equally the idea of trecking around with two young kids in tow isn’t really my idea of fun (nor is it theirs). Keeping things simple works for us and means we all get what we need out of some time away. It can be easy to tucker yourself out whilst on holidays especially when you’re on the go everyday. 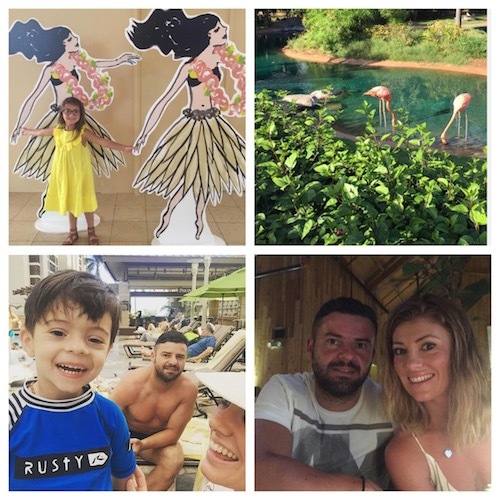 We made a pact that we needed to chill out as much as possible whilst in Hawaii for the sake of our wellbeing – it was, without doubt very easy to do so in Hawaii. Make no question about it, I’m not ‘fussy’ per-say but it’s plain as day, I’m a whole-foods kinda girl. Last visit to Hawaii I was horrified by the food. This time, we made a special effort to really get onto where the good food was at! Here’s my list. bills Sydney – Our very own home grown talent Bill Granger’s restaurant has opened it’s beachy vibed doors in Waikiki and honestly – some of the best food I’ve ever eaten was here. BuHo – Hello Mexico! Fresh, fun and delicious! Check out the goat cheese salad and the street style BuHo Fajitas. Morimoto – The start of Iron Chef, Morimoto’s wonderful restaurant was a delight. We ate here for our anniversary dinner and enjoyed amazing food. The kids were happy too with an awesome selection of sushi. Gyu Kaku – Olivia’s absolute favourite (we ate here A LOT), cook your own! Japanese themed, this restaurant was a blast not only because it’s super fun to cook on your own personal flame grill right in front of you BUT because the food is awesome. You can order ‘bags’ of vegetables that you steam over the hot plate alongside meats which you can season and marinate yourself if you so choose. One thing we generally do is head to the supermarket when we arrive in a new place to stock up on snacks and staples for the kids. This means we aren’t talked into buying sugar laden snacks that send them wild and we all keep our sanity and health in tact. That said, I relax a little when on holidays with the kids and food. After all, it’s about creating memories and allowing them to enjoy themselves too. Their favourite thing – ICE CREAM! (insert cringe emoji) Daddy K may also have overdosed on New York Style Cheesecake. In any case, I highly recommend the local supermarkets (ABC stores are great but a little exy), but Wallgreen’s and Walmart are just a short stroll away. One important aspect of holidays is caring for your skin – especially when you’re in the sun a lot. I once shared a post about eating/drinking your sunscreen. Before you giggle too much about that – check it out here. Looking after your skin is indeed more than what you pop on topically. My absolute favourite sunscreen is the wotnot brand (which can be hard to come by). My back up supermarket brand (if I get stuck) is the Invisible Zinc especially for the kids. Once my skin has a good base tan, I prefer to regulate my time in the sun rather than lather myself in sunscreen. If I know I’m going to have long term exposure, then of course I practice being sun smart, but I find that coconut oil which has a natural SPF of around 4 does the trick. Investing in a good hat is also an excellent idea. I purchased mine from Truffaux (in Hawaii but made in Australia!) I was also given some gorgeous organic skincare from Endota Spa which my skin seemed to LOVE whilst I was sunning it up. The kids absolutely LOVED the Honolulu Zoo. If I didn’t have kids, I would have absolutely done a surf session, gone diving, boat cruising and possibly taken a ride in a helicopter. There’s always next time, because there’s no doubt, we will be back again and again. Want to see more of my holiday snaps? Head over to my instagram account and you’ll find more food and fun pics right there. Please Note – this is not a sponsored post. I am not endorsed by any of the mentioned places or products.